Camp Dark Waters’ Outdoor School offers a unique educational experience to your students. Our goal is to create a living-learning community that integrates the social development of the community with academic experiences. Objectives that are woven throughout the experience are designed for the student to improve his/her self-concept, to work together with others for the benefit of all members of the community. 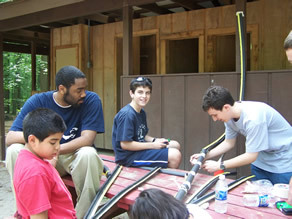 The programs help the students recognize that the community is comprised of individuals with their own individual needs and to appreciate the individuality and uniqueness of each other. 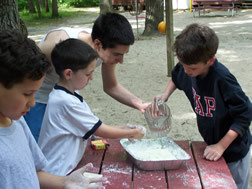 As they participate together they gain an understanding of what education can offer. 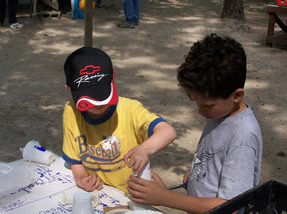 In consultation with the classroom teacher, the Outdoor School program is tailored to the school’s curriculum and goals. The Outdoor School’s curriculum emphasizes learning motivation. The goals of the classes are for the student to actively learn by doing, to understand and recognize the relationships between the major subject areas, to realize the importance of working toward an attainable goal, and to gain an understanding of the personal value he/she can gain from education. Having spent a morning, afternoon, day, or overnight at Camp Dark Waters’ Outdoor School, living and learning together, students develop a sense of school community, a confidence in themselves, and an appreciation for others that carries over to the school community. They see their classroom teacher as a person and friend in the learning process. The strengthened peer cooperation and expanded student-teacher relationships have an influence on the cognitive growth of the students throughout the school year. Students return to the classroom united through this shared experience to achieve the common goal of the pursuit of knowledge. The students at the Outdoor School are active students, participating in their own education. They become lifelong students who continue to grow, and to look at the world with wonder and curiosity, and who continue to learn long after their diploma says their classroom education is over.